The problem with the fan dipole is that it is easily spun around upon itself when the wind blows and must be then unwound in order to remain operational. This is because the fan dipole is supported from the 80 meter legs with the 40 and 20 meter legs hanging underneath. These extra legs create a two-dimensional structure similar to a fan blade, which is easily twisted by the wind along the axis of rotation formed by the 80 meter legs. The OCF antenna is a single wire dipole and will not have this problem. Unlike conventional center-fed dipoles, which are resonant at odd harmonics of the fundamental operating frequency, the OCF antenna is resonant at even harmonics. This makes the OCF antenna a convenient choice when operation on 80, 40, and 20 meters for HF emergency communications is desired. Since the OCF antenna is not fed in the center, its resonant feed point impedance will be greater than 50 ohms. A 4:1 current balun is used for impedance matching purposes and to force equal currents in both legs of the antenna. 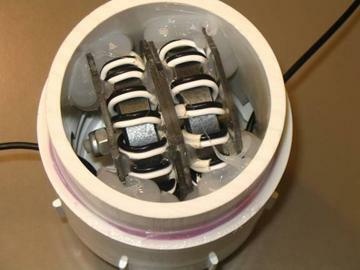 A custom current balun was designed and built for this application. The OCF antenna dimension is 135 feet, divided into two legs, one 2/3 of the total length (90 ft) and the other 1/3 of the total length (45 ft). 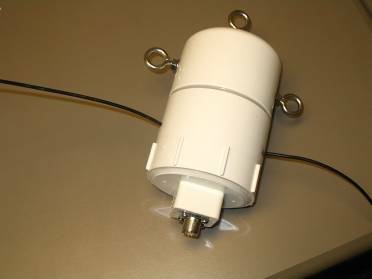 A custom 4:1 current balun was designed for the OCF antenna. Photos of the current balun are shown below. Balun performance was measured using a network analyzer and shows a flat response from 1.8 to 30 MHz.